The PEI Association of Planners is looking to recognise a local community builder again this year. Nominations for the 2018 Murray Pinchuk Community Builder Award will be accepted until October 23, 2018. Full details and nomination form can be found here. In conjunction with World Town Planning Day, the Prince Edward Island Association of Planners announced today the recipient of the 2017 Murray Pinchuk Community Builder Award. The annual Murray Pinchuk Community Builder Award is offered in memory of the late Murray Pinchuk. The award recognizes an individual, group, or organization that has, through their outstanding volunteerism or exemplary action, demonstrated an extraordinary commitment to making their Prince Edward Island community a better place today and for the future in a way that touches on either the built or natural environment. 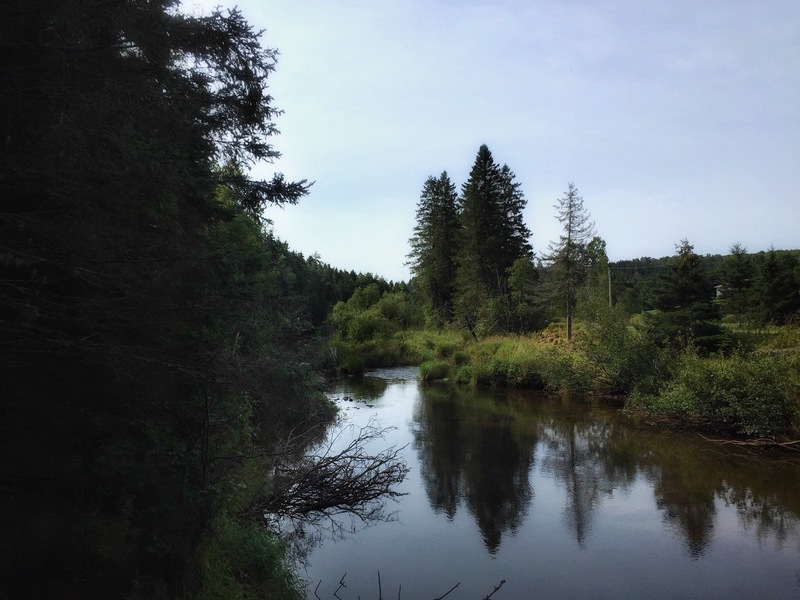 This year’s winner is the Bonshaw Hills Public Lands Subcommittee for efforts to establish the popular provincial park and for developing a management plan for the park properties. Brian Thompson and Megan Harris, co-chairs of the subcommittee, were recognized on behalf of the Subcommittee members. The Murray Pinchuk Community Builder Award recognizes the highest standard of community building excellence in the public and private realms. 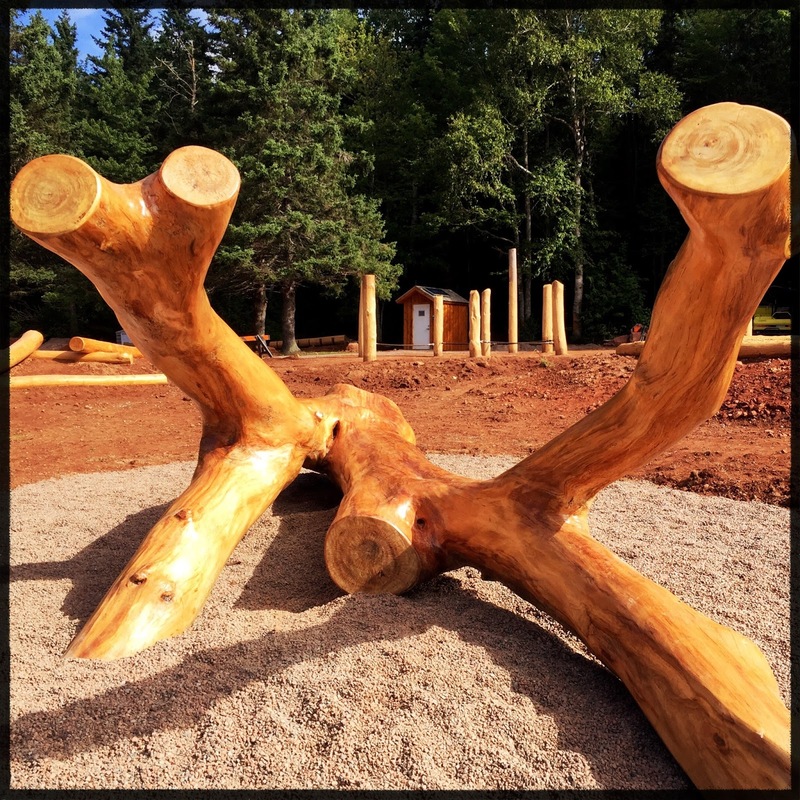 This may include excellence in lifelong service, innovative or accessible site design, promoting land use planning in their community, or any other exemplary achievement enhancing the interaction between people and their environment. Since December 2012, the 16 members of the Bonshaw Hills Public Lands Committee (BHPLC), representing various government and non-government organizations, have provided guidance on the development and protection of valuable public lands in the Bonshaw area. In October, 2013 the BHPLC presented a report to Government, "Recommendations for the Conservation of Public Lands, Bonshaw - New Haven". 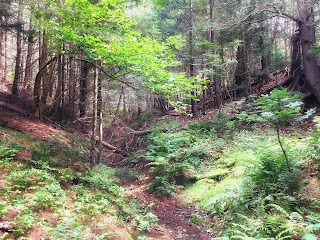 This report outlined 20 recommendations to government on the long-term protection and management of environmentally sensitive lands in the Bonshaw Hills. 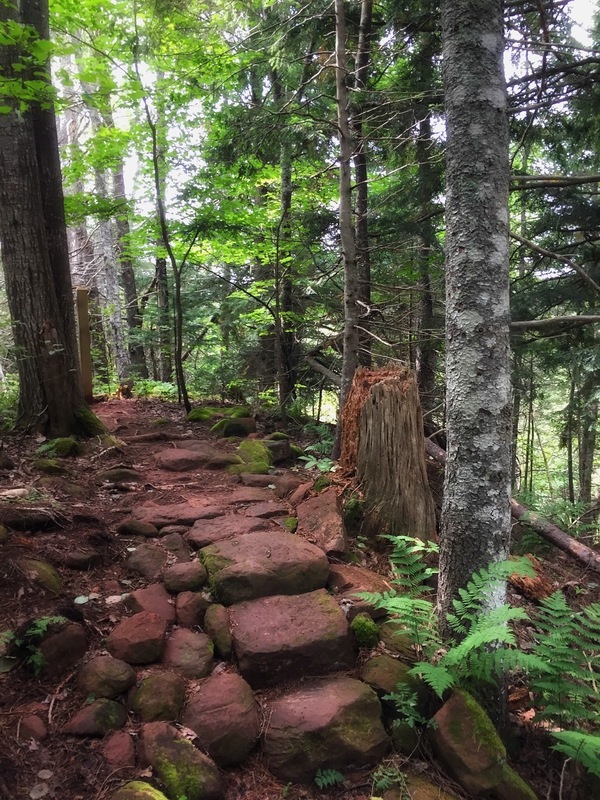 A subcommittee has been working together since January 2014 to implement many of the recommendations contained within the report, including the creation of a 600-acre, four-season park that provides linkages between Strathgartney and Bonshaw. Through a partnership with CyclingPEI, more than 26 kilometres of multi-use trail has been constructed within the park, and a natural playground has also been constructed. As recommended by the committee, the parkland has been protected through the Natural Areas Protection Act (NAPA). The project was selected for the award in recognition of the breadth and scope of the management plan, which outlined a range of broad values and goals, as well as the quality of the implementation process. 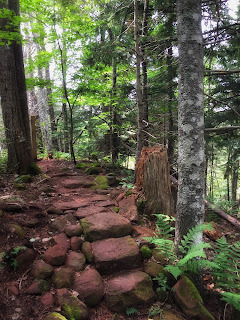 The management plan provides an effective example of how a multi-objective exercise can be undertaken and implemented, and the popularity of the park speaks to the balance achieved in providing active recreation opportunities for the community at large while allowing for the protection of a large natural area. 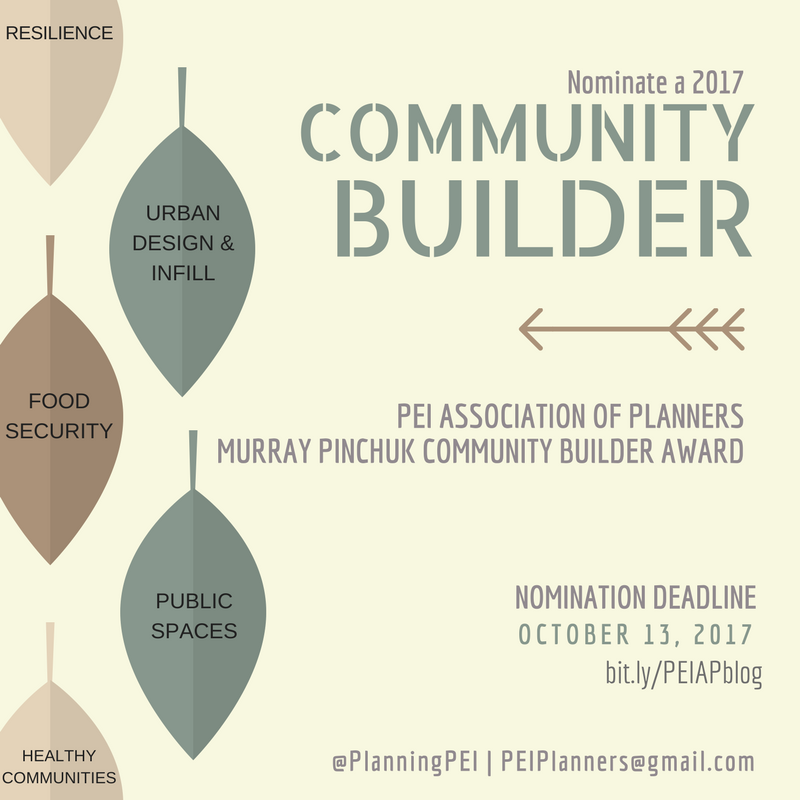 Nominations are now open for the 2017 Murray Pinchuk Community Builder Award. Nomination forms can be found here. The deadline for submissions is October 13, 2017. The 2017 Atlantic Planners Institute conference is now less than a week away and the PEI planning committee is looking forward to welcoming everyone to Charlottetown. For full conference details, visit www.atlanticplanners.org. Conference planning is well underway. For full details on the 2017 API-PEIAP conference, taking place in Charlottetown September 27-29, visit atlanticplanners.org. The conference committee is accepting proposals for conference presentations until April 28, 2017. The PEI Association of Planners, in association with the Atlantic Planners Institute, is pleased to announce that the 2017 API conference will take place in Charlottetown from September 27-29, 2017. Stay tuned for more information on the conference theme and the call for presentation submissions. The PEI Association of Planners is a member organization of the Atlantic Planners Institute, and is affiliated with the Canadian Institute of Planners.